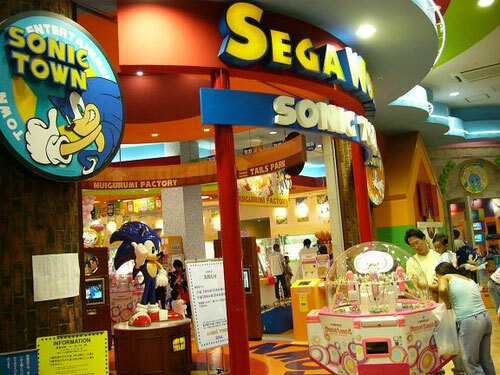 Even more Sonic places in Japan! These places focus on actual buildings and events, rather than the Sonic Super Store as on the previous page. This doesn't make them any less exciting to visit, though! This is sort of a Costume Character and a place all in one. 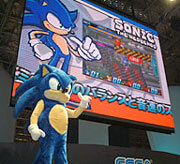 A Sonic the hedgehog suit points to a display of Sonic Battle, the portable game. This looks like it's being introduced at a show. 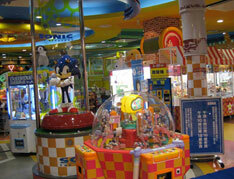 This is a "Sega Fun Zone", possibly like an arcade or giant game display of some kind. 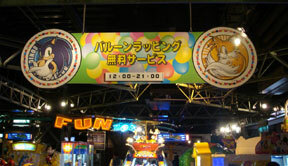 You can see various Sega arcade type games, and hours of operation. This looks like it's from around the Sonic Adventure 1 era, due to the portraits on the big sign. There is an Anime called BlueSeed. Someone who drew it was a Sonic fan! Yes, the section is called Sonic Places AND Events. This show cameo is sort of an event. 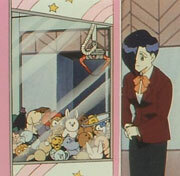 The Sonic Doll appears in every scene here. 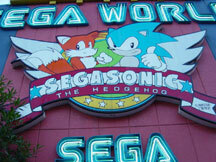 Here's an older Sega World Japan sign. Notice that it's using the older "Segasonic" word. The sign has real neon in the letters, and no doubt, the big plastic Sonic & Tails in the logo light up as well. The sign is very well done, with a nicely on model Sonic with Tails...it's good its cute and it doesn't scream 'boring rerun stock art'. This sign COULD be the older version of what you see above before it got Sonic Adventure-ized...or it could be a different place all together. This is a wonderful sign to see. Photo discovered by Rae_Logan. 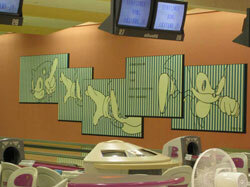 The left photo is of a somewhat sculpted wall decoration in the bowling alley. 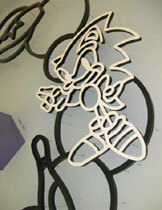 It is a bent metal or plastic in the form of a Sonic classic line art. 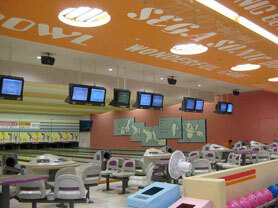 Line art of bowling balls and pins with stars on them help form the background, as well as hold up the Sonic piece. Photos by The Honeymooners. 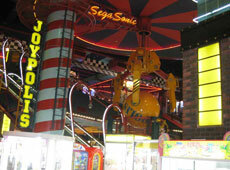 At the Joypolis arcade type area in Japan, you can see Sonic style decorations everywhere. 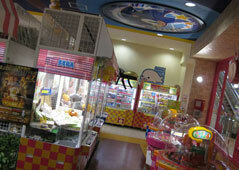 This display (2 different views) has a giant replica UFO catcher claw coming down to grab a huge logo ball. 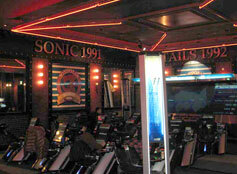 "Sega Sonic" is written in neon script above, while a stripy pole from Sonic & Knuckles is in the background. 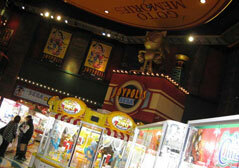 The foreground shows various prize games you can try. How do you get around in Joypolis? Through Sonic themed doors! The one at left is very stylish with a white line-art Amy on its' frosted glass. The handle to the right features classic Sonic giving a peace sign. 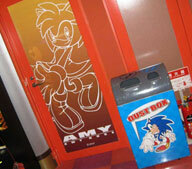 You can also see the SA1 themed trash can (it has a speech bubble added which says "Dust Box" for whatever reason) A machine is next to the door on the right. 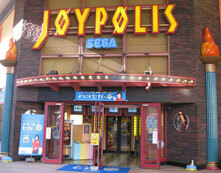 This is the outside of the Joypolis building. It has fake torches, more signs, and Sonic themed windows. You can see the silver portrait in the round windows beside the doors. There are also Sonic decals on the doors. A Knuckles Awning is a neat thing to see, especially over some place called Sonic Town, though it didn't look to have much Sonic stuff in it. Yes that's a portrait of Tom Nook. 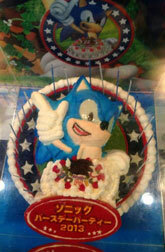 Neon signs with Sonic are everywhere in Joypolis. See classic Sonic with stars and stripes (1991 is written under the circle) and the room with many seats in it (left) has his name on the wall, as well as Tails 1992, plus, large wall hangings with Sonic, a ring and banners. Of course, you can expect loads of fun games too, and prizes. To the left notice the checkered theme, to look like the Green Hill Zone ground! Plus, there's a small SA style statue, and catch the Knuckles circle/decoration in the back. 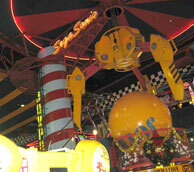 Gold Sonic statue presides over the games to the right. 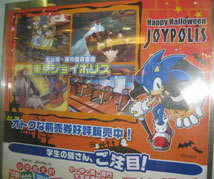 This is an ad found in Joypolis at the time. It's under plexi, but you can tell it's for their halloween event. It has a seldom-seen art of Sonic in a cape, with a walking stick. He's offering to the viewer a jack o lantern which is wearing a witch hat, as bats fly in the background. Curiously this is the 2nd official time that Sonic has been portrayed dressing up as a vampire or 'spooky gentleman'. All photos in this section provided by The Honeymooners. 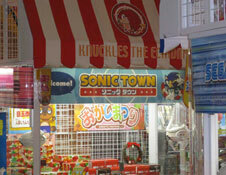 The Tokyo Game Show (TGS) for 2011 had a display case in their Sonic Generations booth. At the booth you could get stickers, see a mascot suit, play a demo of the game, and then look into this case to see several Sonic things. 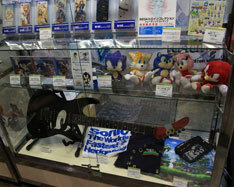 You can see both of the expensive new shirts (typographic & Generations) the famous black guitar with shoe shaped top, some of the Embroider Eye plushes, sound tracks CDs and...what's that square Sonic item on the middle shelf? It is a large size pepakura (papercraft) Sonic built from a pattern and colored cardstock. This is some sort of interesting double cake. It's made in the image of the CG graphic you see above where Sonic is waving a finger above a white cake decorated with strawberries (Japan is fond of inverted strawberries for whatever reason) & a chocolate Sonic head logo. The actual cake below is a round cake with relief/semi 3D Sonic combined with another smaller cake to match the graphic and a....food item (fondant?) oval that has has name, a word and 2013. Notice the shiny gel for the eye, it makes it shine like the CG art. Blue & white candles are added around the star ring. The whole thing appears to be frosting rather than all fondant. This is a special carpet! Sonic rug? Why not! 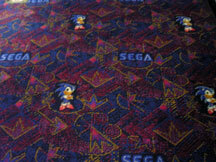 This is an industrial carpeting (so, it can only be seen at Segaworld, where it is/was located...and is thus not a house-wares item) It features repeating patterns of arms-crossed classic Sonic & Sega logos. The rest of it is very busy with pink, yellow & blue geometric patterns. This is to make the floor look very 'active/busy' to the eye, so that you will keep your focus on the other objects in the room instead of looking at the floor too much. (A tactic used most often in casinos) However, with an actual Sonic pattern stitched in, looking at THIS floor is a great idea! Where would be a cool place to go? Sonic Town! What is Sonic Town? Well, it looks like some kind of Sonic themed...area....of somewhere indoors? 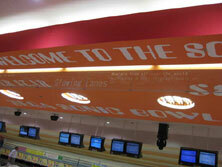 Probably Japan SegaWorld (judging from the W up there) but this looks pretty modern. Why have there been no photos of this? See what you can spot in this big photo. 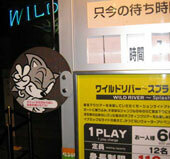 Nuigurumi Factory, Tails Park, Chao something, a medium size statue, several machines & an 'information' card. What a curious place! Do write in with details or photos to add, if you have any!